The ear can be divided into three parts; external, middle and inner. This article will focus on the anatomy of the external ear – its structure, neurovasculature, and its clinical correlations. 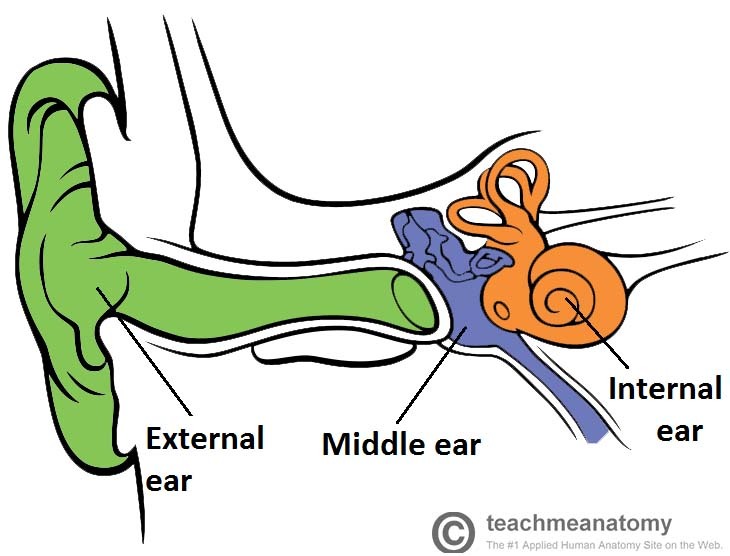 The external ear can be divided functionally and structurally into two parts; the auricle (or pinna), and the external acoustic meatus – which ends at the tympanic membrane. The auricle is a paired structure found on either side of the head. It functions to capture and direct sound waves towards the external acoustic meatus. It is a mostly cartilaginous structure, with the lobule being the only part not supported by cartilage. 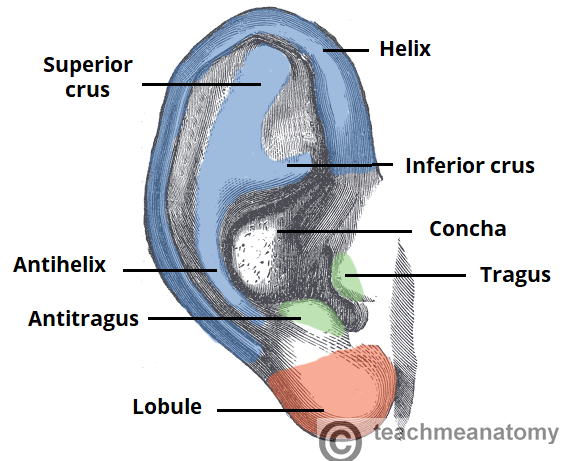 The cartilaginous part of the auricle forms an outer curvature, known as the helix. A second innermost curvature runs in parallel with the helix – the antihelix. The antihelix divides into two cura; the inferoanterior crus, and the superoposterior crus. In the middle of the auricle is a hollow depression, called the concha. It continues into the skull as the external acoustic meatus. The concha acts to direct sound into the external acoustic meatus. Immediately anterior to the beginning of the external acoustic meatus is an elevation of cartilaginous tissue – the tragus. Opposite the tragus is the antitragus. Fig 2 – Anterior surface of the auricle of the external ear. An auricular haematoma refers to a collection of blood between the cartilage of the ear and the overlying perichondrium. It is usually occurs as a result of trauma, commonly seen in contact sports (e.g. rugby). The accumulation of blood can disrupt the blood supply to the cartilage, and requires prompt drainage. Untreated cases can result in avascular necrosis of the cartilage, resulting in a ‘cauliflower ear’ deformity. The external acoustic meatus is a sigmoid shaped tube that extends from the deep part of the concha to the tympanic membrane. The walls of the external 1/3 are formed by cartilage, whereas the inner 2/3 are formed by the temporal bone. Initially it travels in a superoanterior direction. In then turns slightly to move superoposteriorly. It ends by running in an inferoanterior direction. The tympanic membrane lies at the distal end of the external acoustic meatus. 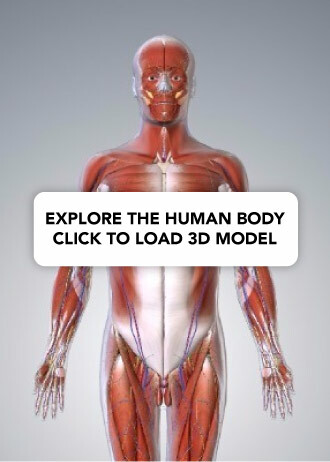 It is a connective tissue structure, covered with skin on the outside and a mucous membrane on the inside. The membrane is connected to the surrounding temporal bone by a fibrocartilaginous ring. The translucency of the tympanic membrane allows the structures within the middle ear to be observed during otoscopy. 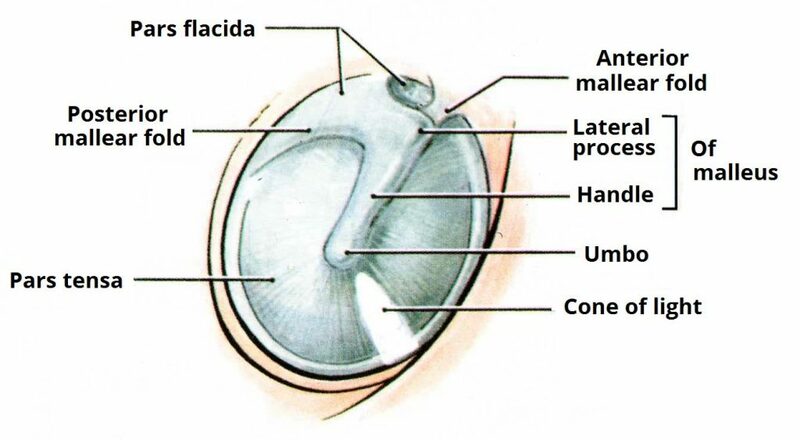 On the inner surface of the membrane, the handle of malleus attaches to the tympanic membrane, at a point called the umbo of tympanic membrane. The handle of malleus continues superiorly, and at its highest point, a small projection called the lateral process of the malleus can be seen. The parts of the tympanic membrane moving away from the lateral process are called the anterior and posterior malleolar folds. Fig 3 – The tympanic membrane of the ear. The tympanic membrane is a relatively thin connective tissue structure, and is susceptible to perforation (usually by trauma or infection). An infection of the middle ear (otitis media) causes pus and fluid to build up behind the tympanic membrane. This causes an increase in pressure within the middle ear, and eventually the eardrum can rupture. In some cases the tympanic membrane heals itself, but in larger perforations surgical grafting may be required. Maxillary artery (deep auricular branch) – supplies the deep aspect of the external acoustic meatus and tympanic membrane only. Venous drainage is via veins following the arteries listed above. Auriculotemporal nerve (branch of the mandibular nerve) – innervates the skin of the auricle and external auditory meatus. Some individuals can complain of an involuntary cough when cleaning their ears – this is due to stimulation of the auricular branch of the vagus nerve (the vagus nerve is also responsible for the cough reflex). The lymphatic drainage of the external ear is to the superficial parotid, mastoid, upper deep cervical and superficial cervical nodes. Which part of the auricle is LEAST likely to be affected by an auricular haematoma? Which structure marks the end of the external auditory meatus? The tympanic membrane is connected to the surrounding bone by a fibrocartilaginous ring. Which bone is it connected to?